​VR and pain: Can virtual reality make us feel better in our bodies? One of the biggest appeals of virtual reality is that it allows us to escape. Whether that’s exploring different places or inhabiting different bodies, characters or even species and genders. Although this kind of virtual reality-induced escapism has a place in the entertainment industry, the medium doesn’t always need to be used to transport us elsewhere. Instead, it can be used to better connect us to our own bodies – or make our bodies feel better when we’re experiencing pain and discomfort. Sometimes that is by ‘tricking’ our brains into thinking we’re elsewhere to reduce the pain we’re feeling here in the real world. Other times it can be used to build more awareness about our current state so that we can be mindful about what we’re going through. Can virtual reality really reduce pain? Virtual reality has been studied as a means of pain reduction and pain management for years now. The positive relationship between VR immersion and reducing pain has been studied in relation to aiding physical therapy for burn patients, helping those in chronic pain, alleviating pain during wound treatment and thousands more instances. 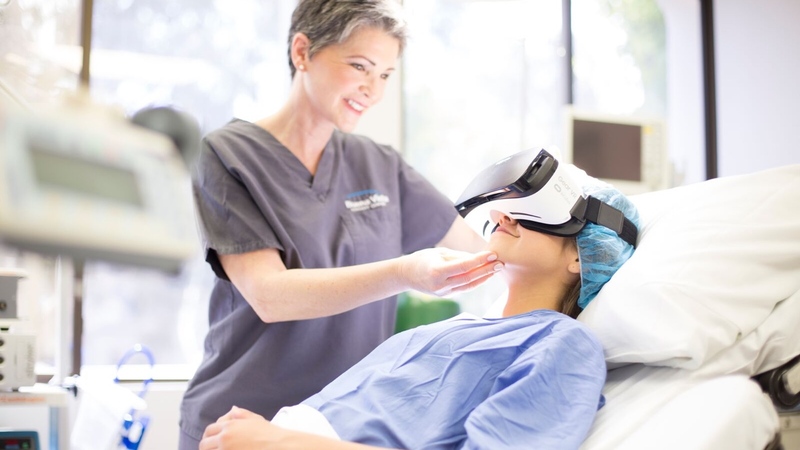 In recent years VR headsets have also been introduced to hospitals in order to see whether they have the same kind of analgesic effect within wards and surgeries. For example, one notable 2017 study carried out at the Cedars-Sinai Medical Center found that using calming VR imagery, on Samsung Gear VR headsets, with patients in pain lead to a reported 24% drop in their overall pain levels. Thanks to these test studies, virtual reality as a form of pain relief, reduction and management is now being much more widely researched and actively used in medical settings. A number of private companies have emerged that focus specifically on tailoring virtual reality experiences to reduce pain. Despite the increasing study and use of VR as a means of managing pain, there’s still no one definitive answer as to why virtual reality can have such a positive effect on pain levels in the first place. Most of the research points to VR as a means of distraction, which certainly makes sense in this context. However, to build better experiences and roll them out to those who need them, we need to find out exactly what VR distraction is and what it looks like in our experiences and brains. That way we can replicate it, and even more importantly, find out whether its efficacy varies across different people with different ailments and whether certain virtual environments are more conducive to pain reduction than others. Previous studies have suggested that those who experience the analgesic effects of virtual reality have a better connection to their bodies. But this closes the door for VR treatment on a grand scale. In an attempt to better understand this relationship between the effects of VR as a pain management tool and bodily awareness, a group of researchers from the University of Kent recently carried out a study that attempted to use virtual reality to reduce pain during exercise. The team monitored participants as they performed an isometric bicep curl at 20% of the maximum weight they could lift, which they were then asked to hold for as long as possible. Half of the participants did this in a room just with weights, the other half did the same but they were wearing a VR headset that showed an arm lifting a weight as they did it. The findings showed that participants in the VR group reported significantly lower pain and effort throughout. They also exhibited a longer time to exhaustion compared to the non-VR group and even showed a lower heart rate. This is fascinating, but expected from previous studies. However, what stood apart about the findings was that the researchers first assessed how much each participant was aware of their bodily sensations, measured by Private Body Consciousness (PBC). Although previous studies showed that individuals with high PBC tended to better understand their bodies, and are therefore more likely to feel pain, this study showed that wasn’t the case. In fact, VR was equally effective across all participants, regardless of their level of PBC. According to Mauger, what the findings show is that VR doesn’t impact on one’s awareness of internal sensations as previously thought. VR headset or distraction machine? There could be a number of mechanisms at play as to why the VR group noticed such a reduction in pain. Mauger suggests distraction is likely to play a central role. “We know that attention to pain affects the perception of it, and distraction can reduce the intensity of pain,” he told us. Distraction techniques have been widely used by clinicians to help with pain, from deep breathing and listening to calming music through to video games. Not only does VR distraction support the findings of other studies, but it also works with the ‘Gate Control’ theory of pain, which suggests that psychological factors can have a big impact on pain perception. The theory suggests that pain signals encounter ‘nerve gates’ when they reach the spinal cord and they need to get through the gates to reach the brain. But other things can get in the way, such as the intensity of the pain or whether other sensory signals are detected, as well as different messages from the brain itself. And distraction doesn’t always mean showing people nice, calming scenes as some studies have suggested or companies have based their businesses on. Instead, the appeal and ability to distract could be down to other factors, such as excitement or even novelty. One of the biggest challenges when it comes to studying pain is that it can be so subjective. Many of the studies that explore pain reduction use ‘pain scales’ in order to rate pain levels and ask participants to rate their pain at different points throughout the research. Not only is this a subjective evaluation carried out by patients, but the perception of pain could vary widely from person to person. It could also vary widely in individuals themselves depending on emotional stress at the time or other physiological factors. If we’re going to move forward and build better pain reducing VR experiences, we need a more concrete understanding so we can build a framework for creating experiences that can induce virtual reality analgesia. A 2006 study carried out by Dr Hunter Hoffman from the University of Washington Human Interface Technology Laboratory (HIT), showed drops in pain-related brain activity while patients were immersed in VR thanks to functional magnetic resonance imaging (fMRI) scans. This showed that VR could change how the brain physically registers pain, not just the perception of it. It’s also valuable to use brain readings like these to begin to gauge exactly how it is that certain VR experiences could be more effective at reducing pain than others. It’s still early days, but as VR is rolled out to more individuals and medical institutions we’re finding out more about what makes it effective in reducing pain each day. There are so many people living in chronic pain that finding a solution that could better manage pain, without the damaging effects of opioids or invasive surgeries, could be nothing short of a miracle.